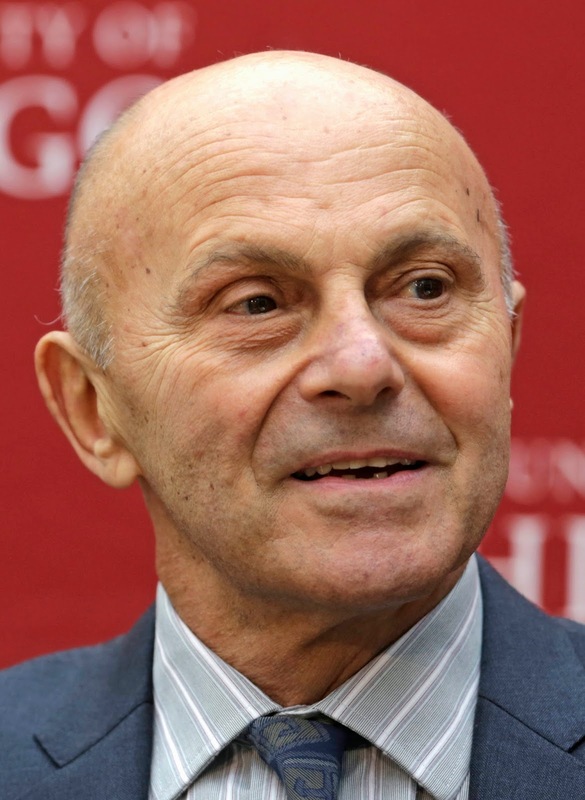 Eugene Francis "Gene" Fama; born February 14, 1939) is an American economist and Nobel laureate in Economics, known for his work on portfolio theory and asset pricing, both theoretical and empirical. He is currently Robert R. McCormick Distinguished Service Professor of Finance at the University of Chicago Booth School of Business. In 2013 he was awarded the Nobel Memorial Prize in Economic Sciences jointly with Robert Shiller and Lars Peter Hansen. Profile at Nobelprize.org: In the 1960s, Eugene Fama demonstrated that stock price movements are impossible to predict in the short-term and that new information affects prices almost immediately, which means that the market is efficient. The impact of Fama's, results has extended beyond the field of research. For example, Fama's results influenced the development of index funds. All of his grandparents were immigrants from Italy. Fama is considered the father of the "efficient-market hypothesis"– the increasingly controversial idea that because at any given time the prices of stocks trading in the market reflect all the available public information about them, the market is "efficient" and therefore tough to beat. Fama, by 1964 a PhD student at Chicago Booth, figured out that you can't beat the market because prices already incorporate the information in easily available signals. Competing traders will seize on any reliable piece of information that prices will rise tomorrow and bid up prices today until they reflect that knowledge. Fama quickly realized that this simple insight had important and unanticipated implications for finance. His dissertation, "The Behavior of Stock Market Prices," followed by "Efficient Capital Markets: A Review of Theory and Empirical Work," published in the Journal of Finance in 1970, revolutionized empirical work in finance and the understanding of financial markets. Fama's work provides the intellectual underpinnings for passively-managed and indexed mutual funds - paving the way for a new approach to investing. That philosophy says that neither luck nor smarts will make you a better investor, and active management provides no additional value. Buying a basket of stocks that reflects the market will yield better results than selectively picking stocks. Fama, now Robert R. McCormick Distinguished Service Professor of Finance, earned tenure at age 26. He has stayed at Booth for his entire teaching career, save two years at the Catholic University of Leuven in Belgium. He has written 105 papers and two books, spanning asset pricing, corporate finance, monetary economics, and related subjects. "When I have an idea, I beat it to death," Fama said in his 2010 autobiography, My Life in Finance. He has taught at Booth for more than 50 years.